By Josephine Marcotty, Star Tribune, 1/17/2015. Minnesota Governor proposes more, and better enforced, buffer strips along lakes and rivers. "The proposed 50-foot-wide buffer strip around all the state’s major waterways would create significant natural habitat in the most ecologically-critical areas. It would protect water from runoff of soil, nitrogen and phosphorus; the most common water pollutants in Minnesota. It would create migration corridors for terrestrial wildlife, and improve conditions for aquatic wildlife." Photo from Welsch, D. J. (1991). "Riparian forest buffers," USDA Forest Service Publication Number NAPR-07-91, Radnor, PA.
Roadsides for Wildlife: native prairie grasses and flowers in roadsides enhance wildlife habitat, provide long-term maintenance savings, increase water filtration, help catch snow and improve aesthetics. 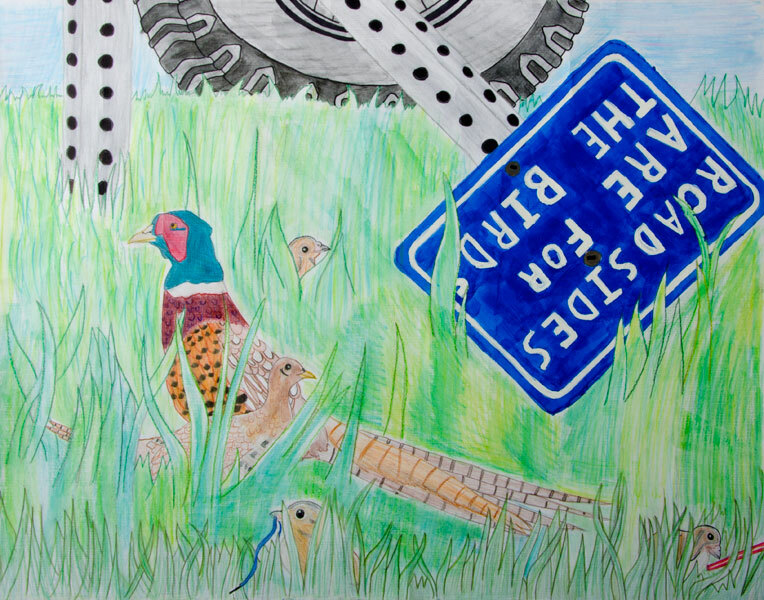 Roadsides are for the Birds youth poster contest. Roadside Wildlife Poster by Victoria Gibson, 1st Place, Judges' Choice, 2014.